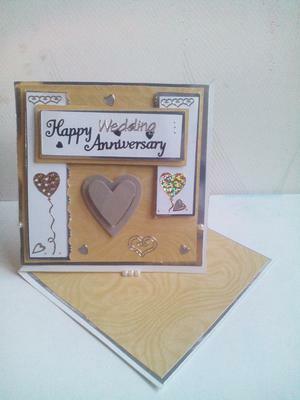 The upcoming wedding anniversary of an elder brother of mine prompted me to make this card. I have used a simple technique that of a twisted easel. 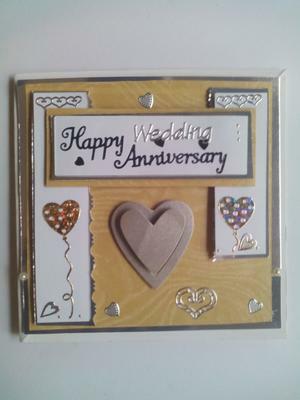 It's a 14 cm square card and I used a white thick card as a base, matted and layered a silver mirror card followed by a gold card. I did the same for the sentiments and added foam pads to give some depths. I wanted the sentiment to have more depth, so I placed two rectangular blocks made of white and silver card matted and layered on both sides(left and right). By the center I added a silver love cut out shape, decorations all around are all peel off stickers. Sliding the card open I followed the same pattern, matting and layering the gold card on the silver card. Pearls from Christina come in handy once more, the front (bottom left and right) and as a stopper to keep the card open. I think he would appreciate this. What do you think? Looking forward to your comments. This card is really pretty and I like the gold color that you have used. 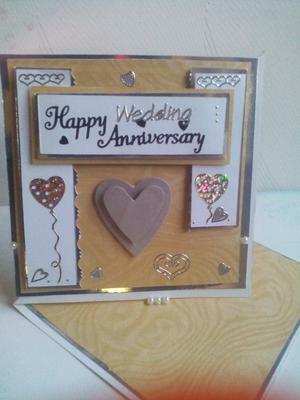 The little pearls have come in handy on the base of your card. To explain to everybody ... Olus is a young man who makes cards and he won one of the regular give aways that I have on the Blog and the bag of "Goodies" went all the way to Nigeria. Hi Olus. I'm so glad we get to see another beautiful card from you! Well Done! Thank you so much for sharing. Enjoy your day. Hi Olus, I found your card design to be of particular interest, as I was just looking at a video on twisted easel cards a few days ago. Your design execution is excellent, resulting in a very nice card that I'm sure your brother and his wife will treasure. And pearls always add a nice touch. Well done.